For conspicuous gallantry and intrepidity at the risk of his life and above and beyond the call of duty as the leader of a special reconnaissance element with Naval Special Warfare task unit Afghanistan on 27 and 28 June 2005. While leading a mission to locate a high-level anti-coalition militia leader, Lieutenant Murphy demonstrated extraordinary heroism in the face of grave danger in the vicinity of Asadabad, Konar Province, Afghanistan. On 28 June 2005, operating in an extremely rugged enemy-controlled area, Lieutenant Murphy's team was discovered by anti-coalition militia sympathizers, who revealed their position to Taliban fighters. As a result, between 30 and 40 enemy fighters besieged his four member team. Demonstrating exceptional resolve, Lieutenant Murphy valiantly led his men in engaging the large enemy force. The ensuing fierce firefight resulted in numerous enemy casualties, as well as the wounding of all four members of the team. Ignoring his own wounds and demonstrating exceptional composure, Lieutenant Murphy continued to lead and encourage his men. When the primary communicator fell mortally wounded, Lieutenant Murphy repeatedly attempted to call for assistance for his beleaguered teammates. Realizing the impossibility of communicating in the extreme terrain, and in the face of almost certain death, he fought his way into open terrain to gain a better position to transmit a call. This deliberate, heroic act deprived him of cover, exposing him to direct enemy fire. Finally achieving contact with his headquarters, Lieutenant Murphy maintained his exposed position while he provided his location and requested immediate support for his team. In his final act of bravery, he continued to engage the enemy until he was mortally wounded, gallantly giving his life for his country and for the cause of freedom. By his selfless leadership, Lieutenant Murphy reflected great credit upon himself and upheld the highest traditions of the United States Naval Service." In addition to the Medal of Honor, his military awards and his inscription on the Hall of Heroes in the Pentagon, Lt. Murphy has received at least 4 other honors between May 7, 2006 and June 2009. On May 7, 2006, on what would have been his 30th birthday, Murphy’s hometown dedicated the Michael P. Murphy Memorial Park; formerly Lake Ronkonkoma Park. The park contains a black granite wall dedicated to the men lost in Operation Red Wing, with each member’s name inscribed. A black granite stone embedded in the plaza bears the picture of Murphy and his Medal of Honor. It never amazes me at the price of the lives some men sacrifice so that others can have the opportunity to live. I am so proud to be an American! Wow, that kind of courage just amazes me and gets my utmost admiration. 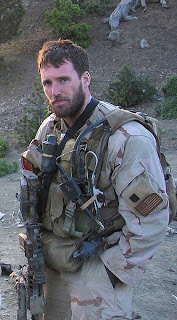 I salute Lieutenant Michael P Murphy. Thank you for sharing what this young man did for his teammates. I "stumbled" upon your blog from one of the ones i follow. I believe there may be a few things you could teach this young man, so i have added your blog to the ones i follow. I thank God for men like this. They represent what America is supposed to be. I cannot understand why our liberal media is so afraid to report more on the stories like this one. Oh yeah. I just answered my own question. The "liberal media". Thank you so much for keeping us informed. I long for the day when people do not have to die like this to protect my freedom- when peace will reign. To men like these, I owe a debt I cannot pay. If you're gonna tell a lie. Tell a whopper.